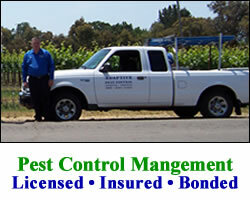 Adaptive Pest Control is a professional pest control management company located in Sonoma, California. We provide fast and reliable service and offer no hassle sales contracts to fit your individual and environmental needs. With so many pests and insects in Marin County California, you need a pest control company who has the experience and know-how to ensure they are handled properly and correctly. Not every situation is the same so don't just trust any pest control company, call Adaptive Pest Control and let us show you. Whether you are having mosquito problems, ants, spiders, roaches or bees, Adaptive Pest Control can offer you the best solution to help get rid of your pest problem. Adaptive Pest Control is a family owned and operated pest control management company which has been serving the Sonoma and Marin County areas since 1997. We are a licensed, insured, and bonded pest control company and a member of the National Pest Control Association.